Jen: I say WOWZA! I'm sure that he'll have the education of a lifetime, training with the LSO. 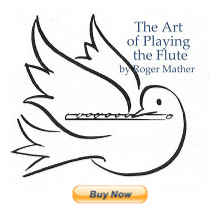 For young flutists who've played 7 to 10 years, though, here are some sound samples of young Adam Walker, to inspire you. Born in Retford, Nottinghamshire in 1987, Adam Walker taught himself to play the flute at the age of 9. A year later he entered Chetham's School of Music, where he studied with Gitte Sorensen. In September 2005 he won a scholarship to the Royal Academy of Music where he is currently studying with Michael Cox and in 2007 he was selected for representation by Young Concert Artists Trust (YCAT). In 2002, at the age of 14, Adam became the youngest ever winner of the British Flute Society Competition and in 2003 won the Royal Over-Seas League prize for the woodwind player with the most promise. The following year he was a Concerto Finalist in the 2004 BBC Young Musicians Competition performing Nielsen's Flute Concerto with the BBC Scottish Symphony Orchestra conducted by Ilan Volkov at the Usher Hall in Edinburgh. He went on to give debut recitals at Wigmore Hall, St. George’s Bristol and to tour the Middle East. He has given numerous radio broadcasts, including appearances on BBC Radio 3 and made his Proms debut in 2008. Over the last year Adam has made his debut at the Proms with the BBC National Orchestra of Wales and with the Academy of St. Martin-in-the-Fields at the Barbican, performed Joe Duddell's Flute & Harp Concerto at Presteigne Festival and given recitals at Wigmore Hall, Mozart BathFest, Spitalfields and Isle of Man Festivals, the latter broadcast by BBC Radio 3. In 2009, at the age of 21, Adam Walker was appointed principal flute of the London Symphony Orchestra and received the ‘Outstanding Young Artist Award’ at the MIDEM Classique Awards in Cannes, in partnership with the International Artist Managers' Association. Engagements during the 2009/10 season include appearances as soloist with the Vienna Chamber Orchestra at the Konzerthaus, the Solistes Européens at the Philharmonie in Luxembourg and with Northern Sinfonia conducted by Janusz Piotrowicz at the Ripon International Festival. On youtube, the middle portion ( approx. 2 minute mark) of this video shows him and harpist partner playing outdoors and laughing it up: GREAT spirit!